Home > Blog > Is Artificial Intelligence Really The Future Of Recruiting? Is Artificial Intelligence Really The Future Of Recruiting? Yes? No? Because ‘Maybe’ just isn’t an option anymore. We don’t have a crystal ball that predicts the future, but are current trends indicative of an A.I. powered future? According to the LinkedIn Global Recruiting Trends 2017 report, automating the hiring process in order to eliminate human bias and time limitations will shape the future of recruiting. Diversity, Artificial Intelligence, and data are key future trends. Artificial Intelligence is reshaping how recruiters source, handle, and hire candidates today. More and more companies are empowering recruiters with technology to save time and resources, while improving the quality of candidates and reducing their time to hire (the current industry average being 1–2 months). According to the Harvey Nash Human Resources 2017 Survey, 15 percent of HR leaders polled from 40 countries said Artificial Intelligence and automation are already impacting their 2018 recruiting plans. Another 40 percent said they expect AI and automation to affect their plans within two to five years. This begs the question: Is A.I. really the future of recruiting? or is it just a passing fad? Competition for talent is one of the top challenges faced by recruiters. A.I. has already begun empowering recruiting teams in gaining an edge in this competitive war for talent. The present A.I. solutions are revolutionizing recruiting processes such as candidate sourcing, resume sorting, candidate selection, interview scheduling, video interviewing, and candidate pipeline management. Candidates are also not far behind in positively realizing how A.I. is impacting their job hunt. According to a recent survey by Allegis, 58% of job seekers are comfortable interacting with artificial intelligence apps to answer initial questions in the application and interview process. More than 60% candidates surveyed were comfortable with A.I. and chat-bots taking care of interview scheduling and preparation. What does A.I. have in store for you? Almost half the employers surveyed(45 percent) said that the time to fill open positions has grown since 2014. A.I. is making screening and candidate engagement more efficient day by day. It can narrow down the search from 4000 candidates to the top 2% within a couple of days resulting in a faster time to hire. You may have wondered how to approach passive candidates at just the right moment. It used to be near impossible to know when a candidate is ready to change roles. With A.I., reaching out to passive candidates has never been easier. It is now possible to predict exactly when a candidate is ready to make a transition. A.I. can also solve the challenge of connecting people with jobs, i.e., helping managers find the perfect fit. 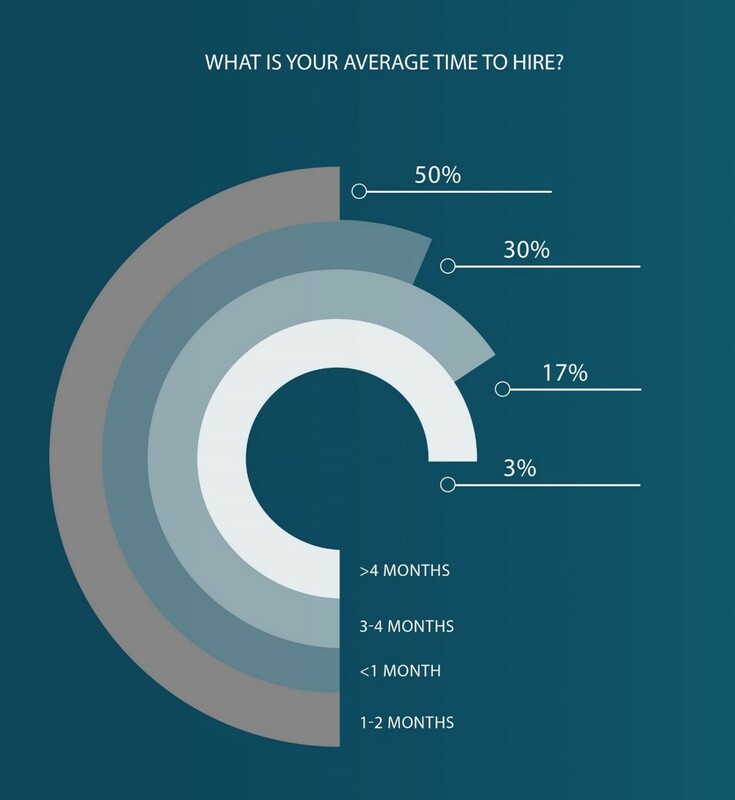 The length of time new hires stay at the company is the most important metric recruiters use to measure their success. AI can accurately predict if a candidate is in it for the long haul, therefore improving the overall quality of hire. AI is already enhancing adaptability, critical thinking capabilities, and problem-solving in action. By implementing AI, recruiters can actually run business simulations that predict how candidates will respond to real world situations and changing scenarios. These may refer to applications that run on computers or mobile devices and adapt to interviewing processes in real time. Industry experts also convey that by implementing simulations, recruiters and hiring managers can gauge problem-solving skills and the ability to work well in teams in real-time. What if you had unlimited budget? What will you do with it? Unlimited budget would be a dream come true for today’s recruiter. Where will they invest it? Here are a few major areas they will probably invest in. 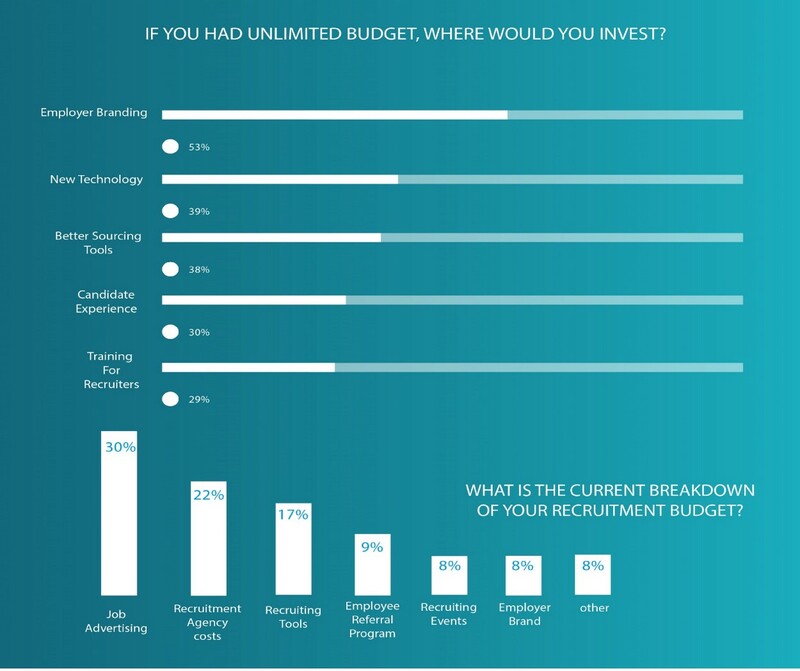 The above analysis proves that there is a higher intent among recruiters to invest in employer branding efforts and new technology. The growing competition for talent demands a higher input of recruiting budget, giving room to modern recruiters to adapt new technology. A.I. is empowering recruiters today to become smarter and more efficient by reinventing the hiring process. Utilizing A.I. tools present in the market, recruiters are revolutionizing their recruiting strategy everyday. 38% of enterprises are already using AI technologies and 62% will adopt AI technologies by 2018! Now is the time to adopt A.I. to gain a competitive edge in recruiting. The future is A.I., and it’s here now. Want to explore how you can leverage A.I. to super-charge your recruiting strategy today? Check out My Ally.